BBC Radio Ulster - Sean Coyle, 05/03/2019 'They're Like Scrambled Eggs All Scrunched Up Behind The Desk"
05/03/2019 'They're Like Scrambled Eggs All Scrunched Up Behind The Desk"
Iris likes Eggheads but Sean doesn't like the way it looks. Margaret in Lisburn thinks there are too many quiz shows on TV. 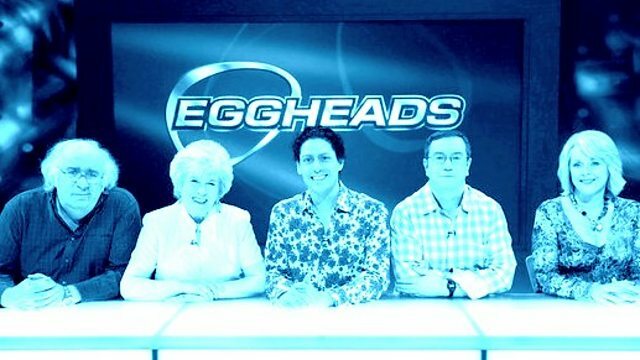 Iris likes Eggheads but Sean doesn't like the way it looks. Margaret in Lisburn thinks there are too many quiz shows on TV. Sean watches the first part of The Chase to see if someone from Northern Ireland is on. The best way to eat a pancake is to put jam on it and roll it up and eat it like you're smoking a cigar. Big Ken was at a snooker event in Belfast but the last ball was potted at half past midnight which is far too late for a man of his age who needs his beauty sleep with Cheltenham coming up. Mary Peters is a Dame and a friend of Earl but there's confusion over where she was born. Alan in Dumfries won a newspaper competition and got a pair of binoculars and a book , which were awarded by Mary Peters. Who was Ireland's answer to Pat Boone? Music from Family Of The Year, Everly Brothers, Boy George, Dolores Keane, Beatles and more. "Please Tell Us Thickos What It Is"